North America is home to eastern and western chipmunks, two species that are similar but whose breeding cycles differ slightly -- eastern chipmunks may breed more often than western. According to the Internet Center for Wildlife Damage Management, there are 15 smaller species indigenous to North America, though eastern and western chipmunks are the most well-known and widely distributed. Both western and eastern chipmunks mate once a year during the spring, says David Sheppard of Canada's Hinterland Who's Who. If the weather stays warm enough in early fall, some eastern chipmunks mate a second time, then go into semi-hibernation during the winter months. The West Virginia Division of Natural Resources reports females can begin breeding less than one year after they're born. If born in the summer, most will breed for the first time during the spring of the following year. A few begin breeding as early as three months after their own birth. When mating season begins, according to West Virginia's Division of Natural Resources, several males compete for a female, who makes a chipping sound to signal her readiness to mate. 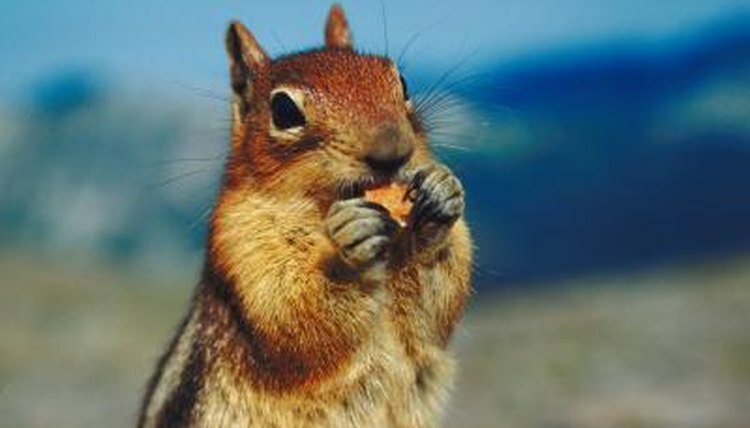 The mating call is the reason chipmunks got their name. The gestation period for both western and eastern chipmunks lasts 31 days. At the end of the gestation period, females give birth to between one and eight offspring. Typically, four or five babies are born in a single litter. According to Sheppard, female chipmunks provide sole care for their young, breaking contact with males after the initial mating. On average, newborn chipmunks weigh about 3 grams. Though they're born with a sparse covering of hair, they won't have visible fur for around 10 days. Their ears open about 28 days after birth, their eyes roughly 31 days. When they're between four and seven weeks old, Sheppard says, young chipmunks leave the burrow for the first time and begin learning to forage for food. Chipmunks born in the spring will grow very quickly during the summer and will be full-grown by early fall. Many will mate the following spring, though some will not mate until the next year. Chipmunks usually live about three years. Older females are more likely to mate more than once a year.